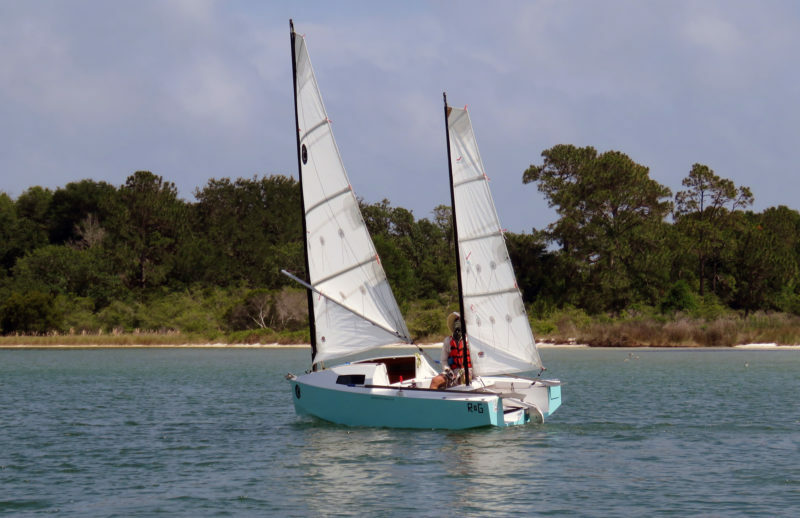 We met the RoG microcruiser by JF Bedard at the Cedar Key Small Boat Meet on Florida’s Gulf Coast. First seen, she was scooting confidently east toward the bright white beach of Atsena Otie Key. The wind was variable over the southwest quadrant and puffing up between 25 and 30 knots. Whitecaps appeared, died, then hackled up again. The RoG tore along, heeled to the puffs, but its pilot started the mainsail sheet and it stopped instantly, waiting upright and stock still like a gun dog for a command, mannerly and calm. The mainsheet came in and the RoG rushed for the beach again. When inclement weather threatens, the cabin can be enclosed and protected with a fabric covering. JF Bedard (Jean-François—he’s formerly of Montréal) created the RoG as a graduation project for Westlawn Institute of Marine Technology. An abbreviation for “River of Grass,” RoG is a nod to the Florida Everglades and the Everglades Challenge that JF endured aboard the prototype. His microcruiser shows its digital heritage as a complete, compact solution to a set of intelligent parameters, which were imaged, examined, balanced, and revised in the abstract of an advanced computer’s algorithms before a single stick was cut. RoG is constructed in stitch-and-glue fashion with 6-mm Bruynzeel marine plywood throughout. The hull, three bulkheads, and two ring frames present themselves as a solid unit of obvious strength; each member is epoxy-bonded to support its neighbors. 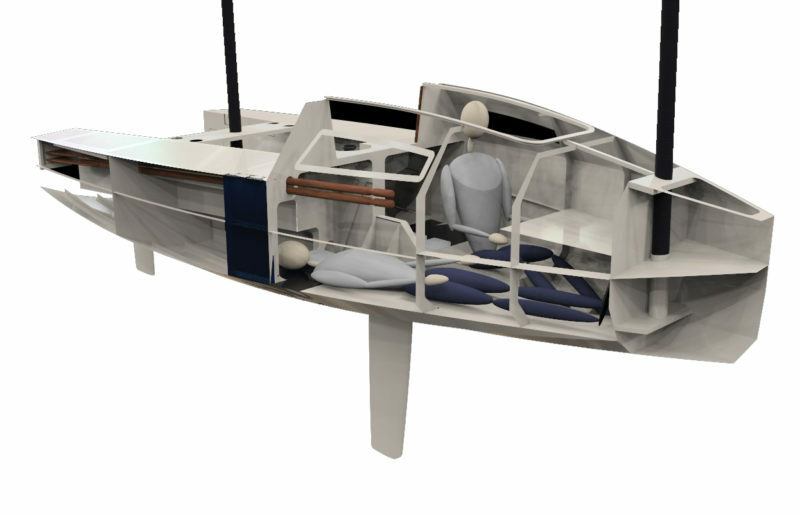 The plywood elements themselves provide 300 lbs of buoyancy; a further margin of safety is provided by two compartments, one set low in the bow and the other in the stern under the cockpit footwell, enclosing 5-1/2 cu ft of foam for an additional 340 lbs of buoyancy. The cabin table drops down to extend the side benches into full-length bunks. RoG was designed, in some part, for the 300-mile Everglades Challenge, a Florida thin-water endurance voyage, but for less grueling adventures the RoG is a charming miniature cruiser. 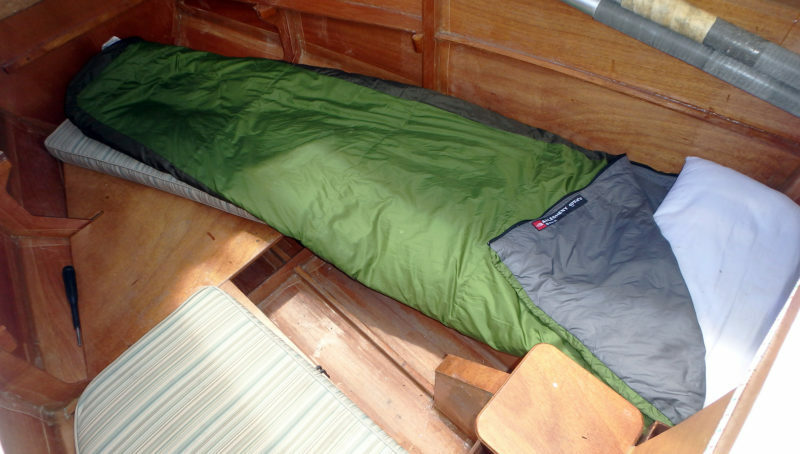 It is just 15′ 3-1/2″overall, 5′ 9″ in the beam, yet it has a deep, comfortable, private cabin with built-in bookshelves forward, obviously designed for a contemplative sailor. The cabin has sitting headroom and offers a chart-sized nav/dining table that drops down to seat level to form two full-sized berths, which are 6′ 3″ long, 24″ wide at the shoulders, and 16″ wide and the head and feet. The cabin provides sitting headroom and a table for dining and navigation. 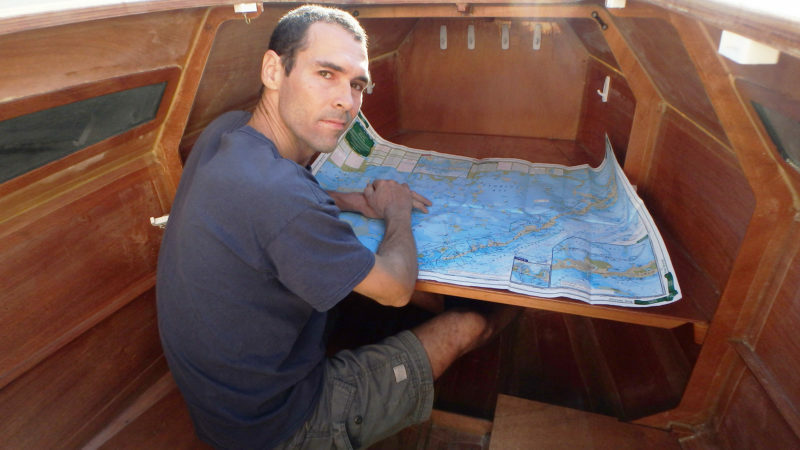 Here the RoG’s designer, JF Bedard, takes a look at a chart of Florida Bay. Aft of these bunks is considerable storage in the spaces under the cockpit seats and footwell for bedding and cruising gear. A pair of large, fixed acrylic windows and a big, airy companionway hatch reaching to the foot of the mainmast dispatch any claustrophobia. The hatch cover is poly-canvas, supported across its breadth by two sprung battens, and when furled, the mainmast and the commodious anchor well in the bow are within easy reach. The anchor is secured to a bow roller, and the well in the bow has room for the rest of it along with the rode and chain. The well has a canted bottom and a scupper to drain water overboard. The mast tube has a drain that opens to the cabin, rather than creating a through-hull fitting and the risk that poses. The drain remains plugged until water can be drained into a bucket. The bottom of the well is angled to drain water through a scupper in the starboard side. The RoG running wing-and-wing shows the open transom that makes the cockpit instantly self-draining. The cockpit is generous: four sailors would not be crowded, with room for a fifth hanging in the big companionway. A fore-and-aft centerline ridge stiffens the cockpit sole and adds height to the rudderhead assembly. It’s a comfortable footrest when the RoG is heeled; hiking straps provide an additional connection to the boat. The high freeboard, the open stern, and the absence of a coaming and toerail make the cockpit feel vulnerable initially, but RoG’s good manners dispel the sense of risk. As the RoG works in light air and into the lee of islands, the oars can be kept in their locks, ready for rowing when the sails aren’t filled. 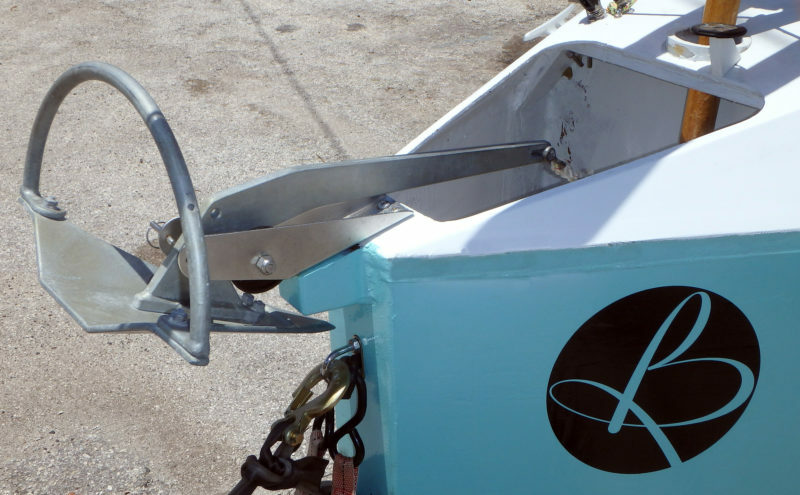 Oarlock blocks are integrally mounted at the outboard edge of the cockpit, placed so a seat on the bridge deck, just forward of the cockpit, is your rowing station. The sweeps would be awkward to stow aboard a small boat, but JF provided a transom hatch through which a pair of oars up to 10′ 6″ long can be tucked out of the way and out of sight, resting in oval slots in the frame beneath the starboard cockpit seat and extending into the cabin. When the oars are not needed, they can be stowed out of the way under the starboard deck. The cover for the access hatch is retained by an internal bungee cord. 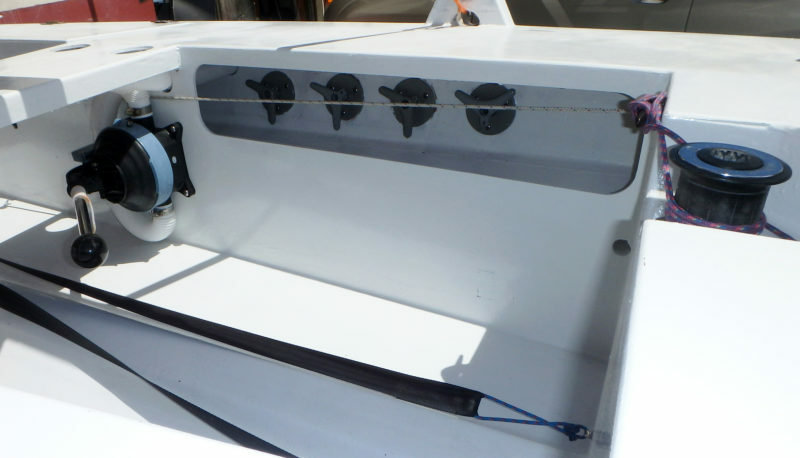 When JF is sailing RoG, however, he keeps the sweeps mounted in their locks with their blades secured by cords at the transom. 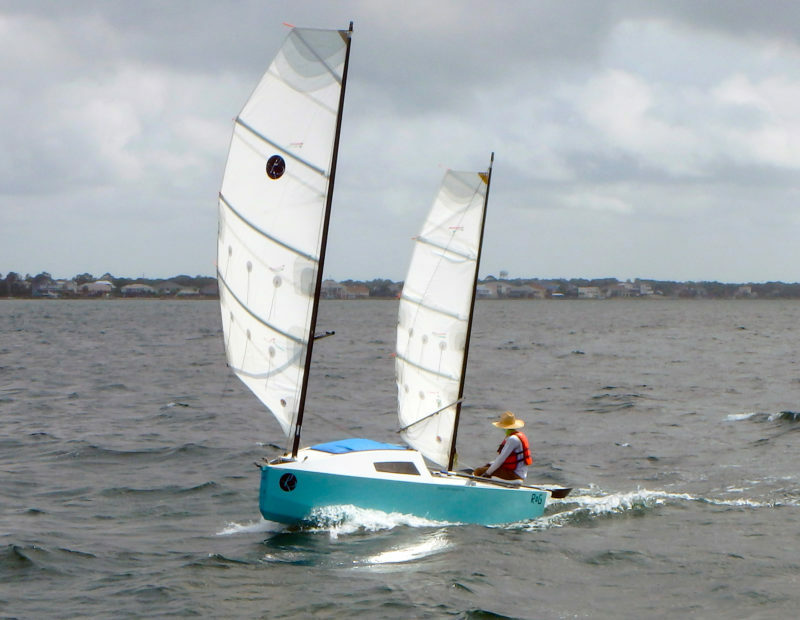 This sleek, flyweight hull should row easily in anything but a stiff headwind that retards her high-freeboard resistance. During the Everglades Challenge JF could row at 2.5 knots over a long stretch, around 5 miles, and push harder for a short while to bring the RoG up to 3-1/2 knots. Having the rudder down and a bit of centerboard down helps with tracking on a longer passage. The centerboard pendant is served by a self-tailing winch set in a recess at the forward end of the cockpit seating platform. With the board up, the boat takes 6″ of water, 46″ with the board down, with 50 lbs of lead at the board’s extremity. 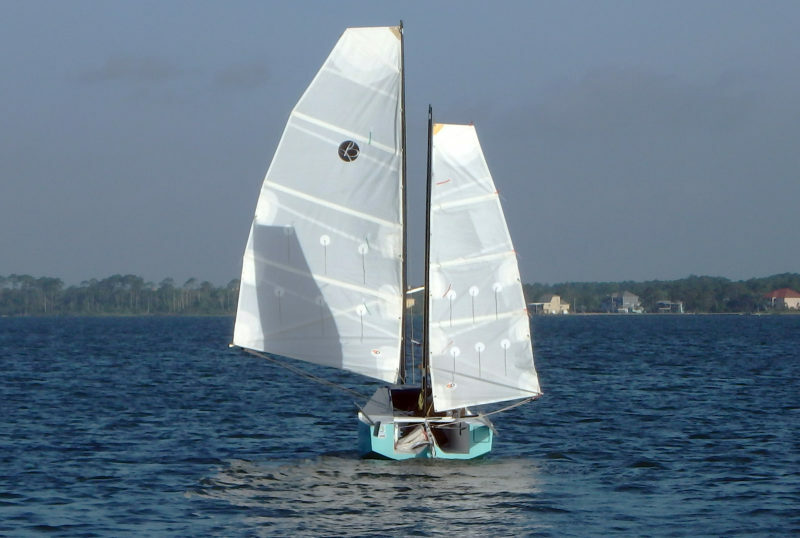 The RoG is rigged as a cat-ketch with 150 sq ft of fully battened sails, 100 sq ft in the main and 50 sq ft in the mizzen. 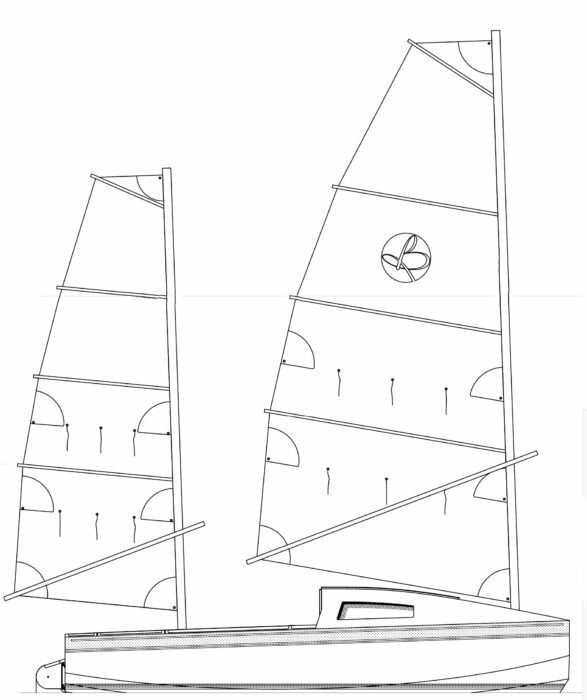 The tapered masts are of carbon fiber, unstayed and equipped with glued-on sail track. The snotter-tensioned, aluminum-tube sprit booms are angled downward and self-vanging. Simple 2x-advantage downhauls are obvious and quick. The mainmast’s foot is close at hand from the companionway hatch so the skipper has a firm footing for mainsail work. Main and mizzen sheets, along with mizzen halyard, downhaul, and snotter converge at the handling bridge/mizzen partner bisecting the cockpit athwartships. The main’s halyard, downhaul, and snotter are secured with cam cleats at the aft edge of the cabin. In the Cedar Key puffs we took our tucks. Topping lifts keep the booms from dropping when the halyards are eased to a marked position to lower the sails. The downhaul’s hook gets reset and retensioned in a reefing grommet on the luff. A dedicated outhaul brings a leech grommet to the sprit, and the snotter is adjusted to tune the sail’s shape. The sheet leads for main and mizzen are well placed and tacking is effortless: the tiller goes across behind the mizzenmast, the sails assume their duty on the new heading. JF’s GPS tracking indicates the RoG tacks through 90 degrees and better. On and off the wind, the tiller was gentle and obedient, easily managed by two fingers. One of Bedard’s touches is a tiller line that loops around the perimeter of the cockpit, under the bridge deck, and across the cabin, just beneath the companionway molding. With this connection, the pilot can make course corrections from anywhere in the cockpit or even from the cabin’s interior. In strong wind, the sheeted-home mizzen occasionally caught the RoG in irons. This is a stumble for many yawls and ketches, and can be avoided if one slacks the mizzen sheet as a craft passes the eye of the wind. As we paced his microcruiser this way and that in the heavy puffs, challenging and besting bigger boats, JF showed me RoG’s “automatic” heave-to. He started the mainsheet and, once again, the boat stopped, its sheeted mizzen managing the boat’s attitude without a swoop or heel. A pump, tucked under the mizzen partner, moves water in and out of the ballast tanks. Four valves direct the flow to and between the port and starboard tanks. The centerboard winch is visible at right. The RoG is designed for water ballast stabilization in heavy weather. We had no ballast aboard but felt no lack of stability. JF prefers to keep the RoG light and lively and seemed reluctant to utilize the ballast option in anything but serious seaway. In that event, a diaphragm pump on the port side of the cockpit, with the help of four Y valves in a locker, moves water into, out of, and between two ballast tanks. Each has a capacity of about 9 ½ gallons—80 lbs—and is set amidships about 16″ off center and extends along the bottom then up the side up to the sheer the bottom. Filling the windward tank adds 80 lbs, which improves performance in a breeze, and filling both tanks increases overall stability and adds momentum to plow through a chop, giving the RoG the characteristics of a heavier, deeper boat. 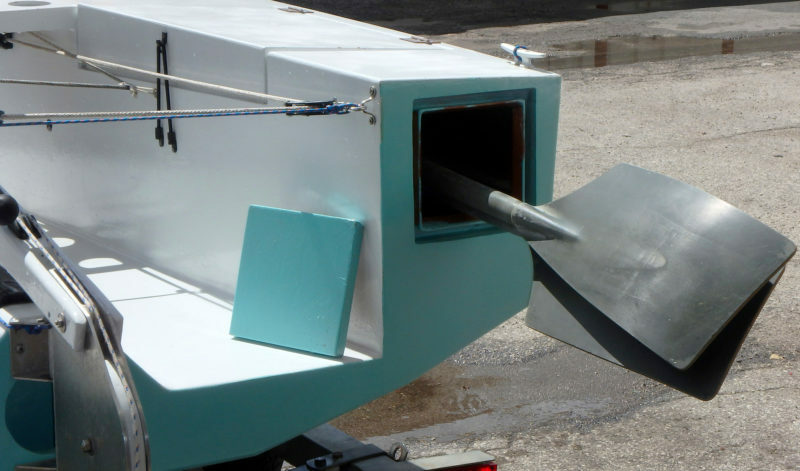 When the breeze picks up, up to 80 lbs of water can be pumped into the windward ballast tank to help counter heeling. Tiny and eager, it’s like a terrier when she planes; 9 knots is not uncommon. Reefed down in whitecaps and heavy puffs, we were steadily advancing, with negligible leeway, at 6 knots. RoG is phenomenally light at 450 lbs with the sailing rig and is eminently trailerable, easily singlehanded, but is in no way a skittish craft. There is some gravitas built into the lines and rigidity in its tiny dimensions. The virtue of the RoG is JF Bedard’s balanced design judgment. The RoG is one of a new generation of vessels appearing fully realized, not by a massive mainframe at MIT, but by laptops—a democratization of invention. Aesthetics and structure are tightly interlocked. The digital designer changes a curve of the bilge, and immediately, changes in buoyancy and wetted area are computed and shown. Optimal solutions are possible over hours rather than years of trial and error. Better solutions depend on how you ask the questions; what are the priorities? The little RoG is a constellation of compromises, but Bedard has weighed each bargain between technology and function with delicate attention, striving for a happy solution. He’s intelligent, technically sound, confident, and he adds a human factor of delight in sailing as a dance with nature. Before giving himself over to the water life, he was a successful professional musician. The dance comes naturally. Jan Adkins is an author and illustrator living in Gainesville, Florida. 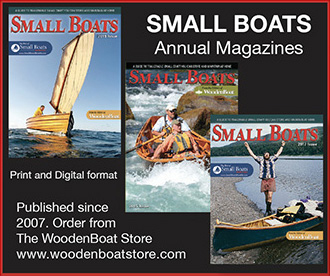 He is a frequent contributor to WoodenBoat magazine and the author of over 40 books. “Getting Started in Boats” is a regular feature he does for WoodenBoat. Draft, board down 3' 10"
The orange areas are flotation compartments; the black areas are water-ballast tanks. The cabin can sleep two. Note the oar handles extending into the cabin. 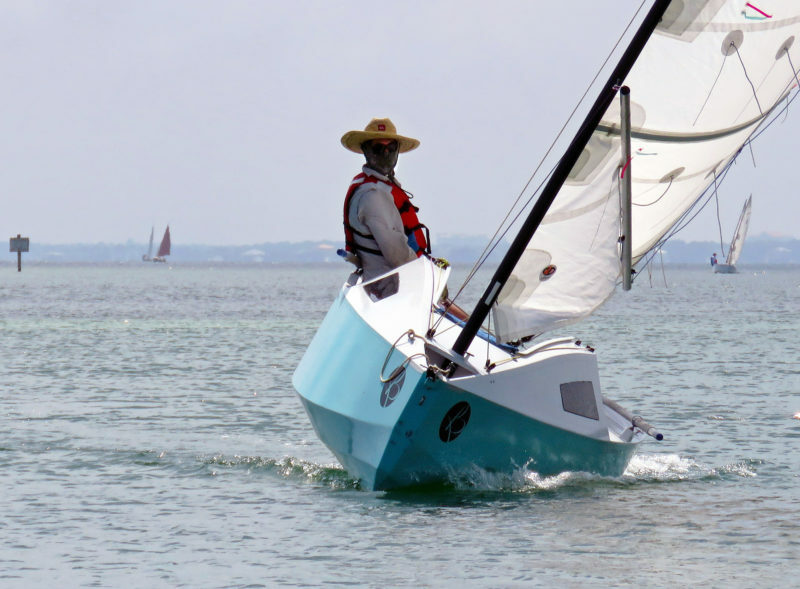 Bedard Yacht Design offers the RoG as plans and full-sized templates at $239 and as a complete kit, with around 140 CNC-cut Bruynzeel plywood pieces, for $2,549. Great article about a really interesting design. Please embed a video or add a link (tons of them on YouTube) so we can see it sailing! Very interesting. I would love to see one “in the wood”. This is a great article and it includes many ideas I’ve thought about but not yet built into a boat. The water ballast tanks are one area I’m looking at in build a trailer/sailer under 20′. I’d like to see more info on how you plumbed the water pumping system to the tanks and is this a sealed system or water brought on board as needed? And like Alan Mudd, I’d be interested in seeing some videos of her sailing. Does anyone make them for the commercial market?